El top de fútbol de manga larga para hombre Nike VaporKnit Strike cuenta con una tela elástica de secado rápido que evita los roces y la humedad adicional. Proporciona abrigo donde más se necesita y ventilación en áreas clave para mantenerte fresco. La tecnología VaporKnit está diseñada para combinar a la perfección una frescura ligera excepcional, menores roces y un ajuste de precisión para mantenerte veloz de principio a fin. La tela elástica se combina con un ajuste entallado para que puedas moverte con libertad y comodidad. Tela: Cuerpo: 90% poliéster/10% spandex. Mangas: 90-91% poliéster/9-10% spandex. Nota: los porcentajes de los materiales pueden variar ligeramente en función del color. Comprueba en la etiqueta su composición real. Tela: Cuerpo: 90 % poliéster/10 % spandex. Mangas: 91 % poliéster/9 % spandex. Lookwise 5/5 Material 5/5 Still haven’t tested it out for soccer but have been wearing it for athlesure. Recommend this top! 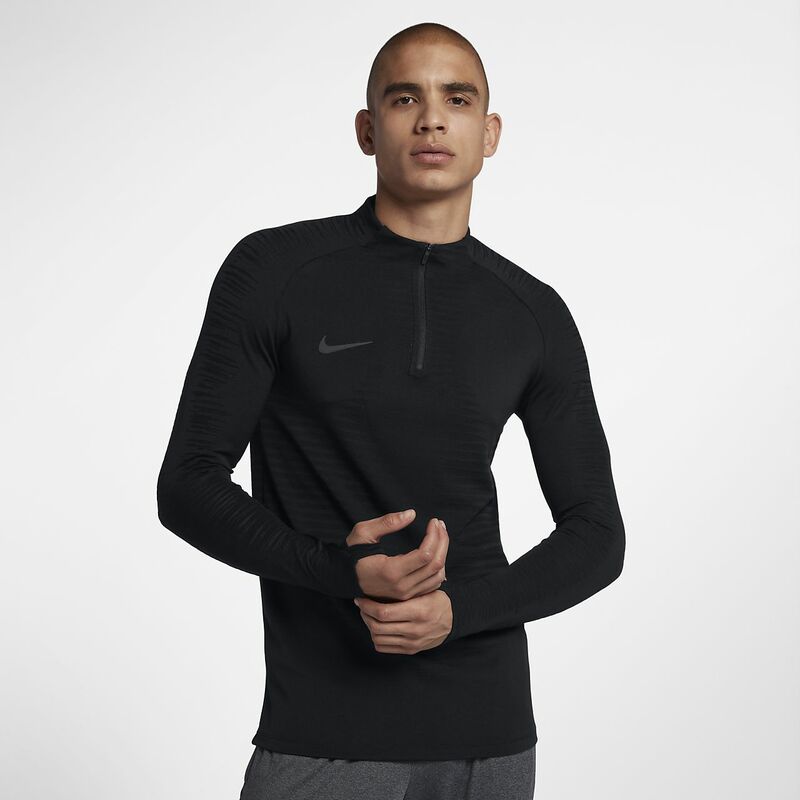 NIKE VAPORKNIT STRIKE DRILL Men's Long Sleeve Soccer Top is pricey but worth it, you get what you pay for and I want the best. I’m a three quarter-zip guy and I love the long sleeves with thumb holes, on the new version they're more like thumb strips - better for throwing a soccer ball. I wear U.S. Men's Large Nike Running and Combat Training Tops, BUT in all Nike Soccer apparel I purchase XL due to them running slightly snug, especially the pants. The VAPORKNIT STRIKE DRILL Men's Long Sleeve Soccer Top has stretch Spandex/Elastane in the fabric content which makes it super comfortable and stretchy as all good sports apparel should be. I wish Nike would add stretch Spandex/Elastane to the short sleeved versions of the training tops and VAPOR jerseys. I'm all about feeling free and completely unrestricted when looking for and purchasing high-end sports apparel. Nike thank you for stocking and selling the All-BLACK colorway here on Nike.com U.S.A. I'm so tired of seeing only Europe and Canada always get the cool colors, we want exactly what they get. I also enjoy wearing these drill tops for casual-wear. Nike what happened to the NIKE FC Line? Please bring it back!